Breakfast and WIFI are included in all prices at the ibis Styles Rouen Val de Reuil hotel. The ideal location for all your leisure and professional trips in Normandy. 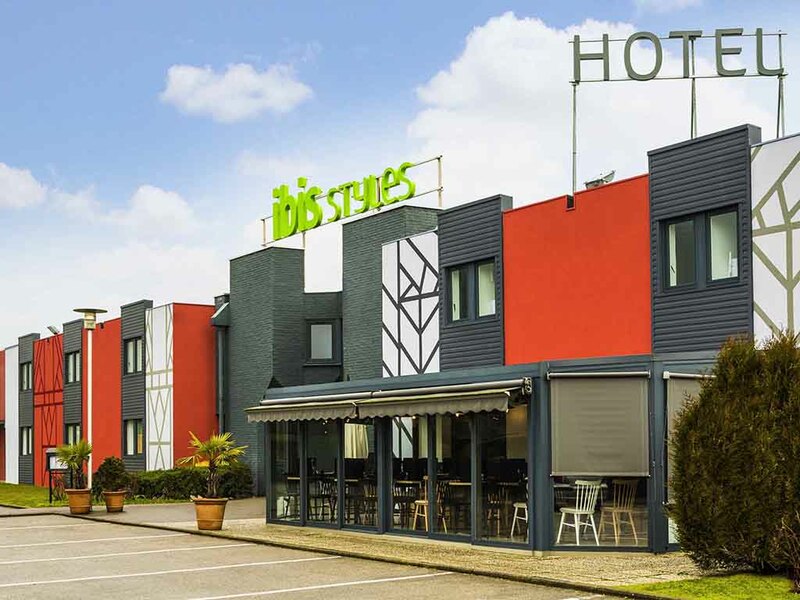 Easily accessible via the A13 highway, the ibis Styles Rouen Val de Reuil hotel is located 15 min from Rouen, 45 min from Giverny, and under an hour from Paris. Take advantage of high-speed WIFI for all your business stays. During the week, enjoy gourmet cuisine for lunch or dinner in our restaurant, le Bistrot d'Eric. Hotel located 30 minutes from Giverny. Visit the Museum and Impressionist gardens. Hotel located 15 minutes from Rouen. Visit its cathedral and its historic center, its museums and shopping street. Our restaurant, le Bistrot d'Eric, offers gourmet and generous cuisine: starter buffets, dessert buffets and numerous home-made dishes. Very happy with this hotel for a one night stop-over. We stay regularly. The staff are very pleasant and the inclusive breakfast is very welcome. The only downside is the lack space in the room. Very pleasant comfortable hotel. Great location. Nice staff and breakfast good. Great overnight stop we have used on many occasions. see previous, also lovely breakfast and very friendly and helpful staff. We always stay here on our way South. It is so covenient to the auto route. The staff are ,without fail ,friendly and helpful. The rooms are clean and comfortable. Breakfast is excellent. Recommend the larger rooms. Our 'stays' at ibis Styles 9Val de Reuil. We're becoming regulars at this hotel. It's a friendly, covenient stopping off point on our trips through France. We always get a warm welcome on arrival and, often get the pleasant surprise of a complimentary room up-grade. Not bad. Glad I booked a larger room. Not bad overall although drains in bathroom were smelly. Glad I booked a larger room as this was only just big enough. Good breakfast. We stay here regularly now and love the convenience of the location on our journey further south, that we can park easily, that our three dogs are welcome, that the staff are very friendly and that breakfast is not only included but also is available until 10am. As before, we couldn't work the air-conditioning controls out but did manage to stop it from heating the room... if we remember in time, next visit we will ask for 'training'! Also as before, the available wifi is very weak and not worth using. As usual we arrived after a long drive and were welcomed at reception by Alice and Justine. We were pleasantly surprised to find that we had been given a room upgrade and this, as well as the rest of our stay, made it memorable. Perfect last minute stop after a change of plans. Lovely stay after a last minute change of plan . Arrived late , welcomed by a lovely team at reception, clean rooms . Practical and functional place . Breakfast was perfect with the very good idea to replace the usual concentrate juice machine full of sugar found in most places by a machine that press fresh oranges. That was the highlight of my stay !! Overall very good stay and very decent price . Third time at this hotel and we were, once again, happy with the service. Staff were friendly and polite. The room was clean and breakfast choice was good. We travel with three border collie girls, one of who sleeps in a very large soft crate (otherwise no-one would get much sleep, as she's very young and otherwise constantly seeking attention). We had stayed here before in a standard room... we found that to be a bit tight with the large dog crate, so we booked a premium room. Still there was not much room for the crate and there was also little room to move around the bed. Otherwise we love the hotel and appreciate the breakfast which is included. Hotel convenient placed for A13 motorway. It is clean and has secure open air parking. We were made to feel welcome by the staff - nothing was too much trouble when we had a query. Our only small complaint/fault was that the shower area of bathroom was only adequate. ie when shower was on full the water overflowed into the other floor areas of bathroom. Conveniently located and comfortable room. Great to have several restaurants within walking distance. Our only disappointment was the quality of Wifi. The connection was very poor and continually disconnected. We need Wifi for our business, so this might affect our decision to stay again, which is a shame as everything else was perfect. The hotel was well situated for pur needs (an overnight stop on a long journey) and while it is obviousl new and very clean the room were rather smaller than expected, certainly comparing with other Styles hotels. There was just enough space to walk around the bed and the shower room with toilet and washbasin was very compact. Thank you for taking the time to tell us about your experience at the ibis Styles Rouen Val De Reuil. I am sorry that your experience did not meet your expectations; please allow me to express my sincerest apologies. Regarding the size of the room and its equipments, we recommend you to choose, during a next stay, towards a superior room. As regular customer of the family ibis, you can so appreciate their size and their similar equipments to those whom you are used to finding at our colleague's. Indeed, the Standard room which you had reserved, was for a price much lower than price practiced by the brand, generally. At Ibis Styles, we strive to provide a superior service experience for every customer; therefore your feedback is very important to us. Please rest assured that we are taking the appropriate measures to address the problem and prevent future occurrence. We appreciate your sharing your concerns, and it is our hope that you will give us the opportunity to better serve you in the near future. very good. room was quite small but was on ground floor as we had requested due to limited mobility. room was clean and comfortable and suitable for an overnight stay. breakfast selection was good and plentiful. staff were friendly and helpful. hotel very conveniently placed near a13 motorway for access to all routes.